Citroën has sent itself on a bit of a retro-future trip with its Tubik concept, a 9-person "executive shuttle" concept shown for the first time at today's Frankfurt Motor Show. The van goes along with Citroën's Multicity project, an intermodal route planner that's up and running in France. Having an online route planer that integrates cars, planes, and trains is certainly a good thing, but an accompanying space pod van concept gives a bit of je ne sais quoi that only Citroën can provide. Like every other van concept since the dawn of time, the Tubik features a wraparound lounge-style interior and a variety of techy entertainment systems. The traditional fare of modular seats, screens, and surround sound are given the Citroën touch, and by that I mean they look bizarre. If just having a madcap cabin isn't sufficiently quirky, you step in through a massive door that swings the whole side of the vehicle open. This might seem like an inconvenience in a crowded Ikea parking lot, but it would be supremely useful when fleeing from Martians with Flash Gordon in tow. We're happy that Citroën is meeting the challenging design requirements of intergalactic adventuring. Strange as the passenger compartment may be, nowhere do you see more of the trademark Citroën weirdness than from the driver's seat, which is tied in with the steering wheel, the pedals, and the Tubik's head-up display screen. Citroën decided to call the whole assembly the "cyclotron," because apparently piloting a land-bound aluminum van that looks like a starship is not enough to make you feel like you're in a sci-fi movie. Not only does the Tubik have room for a full intergalactic flight crew, but it should help you keep the impression of space flight with Citroën's super smooth Hydractive suspension. Citroën also seems dead set on keeping the trials and tribulations of 21st road travel out of the Tubik with its diesel-hybrid "Hybrid 4" drivetrain. You should no more need to pull into a gas station and mingle with the earthlings than you would in an ordinary family car, even though you're driving a 4.80m (15.8ft) long 9-seater van, claims Citroën. As a production concept, it's hard to say if the Tubik's design brief is sound. 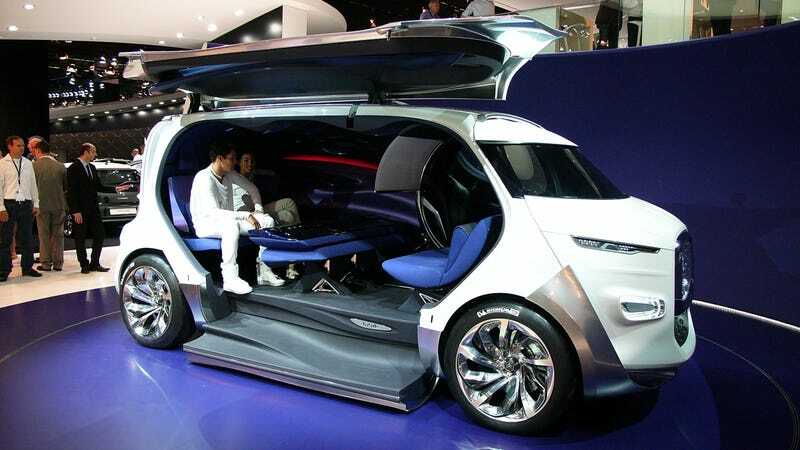 The world may not be ready for a Web 2.0 Syd Mead-style van designed to accommodate large groups of friends and extended families. Regardless of its questionable business sense, the world needs more hyperspace age versions of Type H vans, if only to drive our dreams around in.